Hanoch Young, renowned international speaker and author, is one of Israel's most dynamic Tour Guides. Having been born and raised in the Bronx, New York, Hanoch was involved with many Jewish activist causes while living in the US. Since fulfilling his dream to move to Israel, he has expanded his work to focus upon Building Bridges among all lovers of Israel, worldwide. 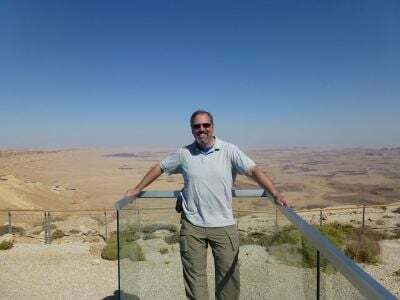 Having completed the arduous requirements of Israel's Ministry of Tourism, he is a licensed Tour Guide, sharing the Israel that he loves so much with all who come to experience the life changing effects of actually being in Israel. Hanoch doesn't believe that people simply 'decide' to come to Israel, but rather, they are pulled to come; in effect, they are 'called' to come to Israel. His presentations and guiding enables you to 'live' the experience of being in Israel and absorbing all of its history and meaning. An Orthodox Jew, Hanoch actually specializes in guiding both Christian and other Non-Jewish Zionist groups throughout Israel. Hanoch's exciting, dynamic style, combined with his background, openness and caring make him a unique messenger from Israel. Coming from Modi'in - the ancient home of the Maccabees, Hanoch is bringing his call for a Revolution for the Restoration to your town. Make sure to hear him speak; it's time to begin making history instead of just reading about it!